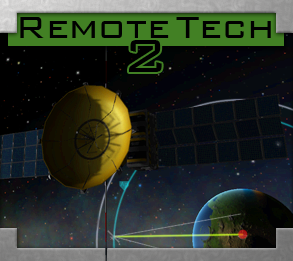 RemoteTech is a modification for Squad's "Kerbal Space Program" (KSP) which overhauls the unmanned space program. It does this by requiring unmanned vessels have a connection to Kerbal Space Center (KSC) to be able to be controlled. This adds a new layer of difficulty that compensates for the lack of live crew members. An extensive instruction manual is available at http://remotetechnologiesgroup.github.io/RemoteTech/ and includes a player guide, gameplay mechanics, detailed part summaries, and tutorials. The source code for RemoteTech is licensed under GPL version 2. The part models are not licensed to the general public and may not be redistributed without permission from their original creators. WARNING: the 1.5 release changes the mod's folder and DLL names from "RemoteTech2" to "RemoteTech". If you are upgrading from 1.4, you must delete the old RemoteTech2 folder before installing this version. We take NO RESPONSIBILITY for any bugs that may happen from having both "RemoteTech" and "RemoteTech2" in your GameData folder. Important: The 'pre-releases' are debug builds of the current development tree. They are not guaranteed to be feature-complete or bug-free. They are intended for those that wish to test out the next version of RemoteTech before it goes on general release and are aware of the risks of doing so. Smart Parts - automated staging and action group execution. Can "program" by chaining parts using action groups. Landertron Rockets - automated approach and touchdown. RemoteTech is not yet compatible with either of the two full-featured autopilot mods, MechJeb and kOS. Mix at your own risk. Descriptive antenna text -- if you get confused about which antennas fit which roles. Now with 100% less Kerbal humor. RSS Ground Stations -- essential for playing with both RemoteTech and RSS. This file MUST go in GameData/RemoteTech, or it will not work. To make a Bug Report, please use the Github issue tracker. You can browse the current list of issues to see if your problem has already been reported by somebody else at https://github.com/RemoteTechnologiesGroup/RemoteTech/issues. Please follow the instructions at https://github.com/RemoteTechnologiesGroup/RemoteTech/blob/master/CONTRIBUTING.md when reporting your bug. Forum posts are difficult to track, and incomplete reports make it impossible for us to locate the source of the problem. RT1 Contributors: JDP, The_Duck, gresrun, Tosh, rkman, NovaSilisko, r4m0n, Alchemist, Kreuzung, Spaceghost, Tomato, BoJaN, Mortaq. RT2 Contributors: JDP, Cilph, TaranisElsu, acc, Vrana, MedievalNerd, NathanKell, jdmj, kommit. RT2 v1.4.0 and beyond is maintained by the Remote Technologies Group, a community effort to ensure the proliferation of unmanned vessels throughout the known Kerbalverse: Erendrake, Pezmc, Starstrider42, Peppie23, woogoose. Additional contributions were made by Dail8859, Grays, Jsartisohn, MOARdV, and Reignerok. Thanks! And hooray no more ship copies. Nothing constructive to add other than a hearty "hooray!" as I've been looking forward to getting into this more deeply. IT LIVES!!!!!!! Time to get the part hats out! Wat. Remotetech was working fine before now. If you wanted to use it then why didn't you? Anybody know where to find the settings file where I can turn off signal delay? Quick remark: the version file is set to 1.3.3 so version checker complains that 1.4.0 is available. Except I messed up during install then please ignore me. The version file is in fact set to 1.3.3. This can be fixed by opening the version file with notepad and changing it to the correct numbers, and is anyone going to tell me where the settings file is located? and is anyone going to tell me where the settings file is located? Ok, I suggest the devs put that in the guide. ...aaaand we have our first bug report. I could swear I updated the file before we packaged everything. Thanks for the info, I'll get a corrected copy up ASAP. It's on the to-do list, don't worry. Speaking of bugs, my flight computer isn't pointing my ships to the correct headings. Could someone check this on their end? It's a known issue, but we've never been able to reproduce it consistently. If you could upload a copy of your save file (preferably with as few mods as possible) and KSP_Data/output_log.txt to the issue tracker, it could help us pin it down. I meant putting that the settings file doesn't generate until you start the game for the first time with the mod should be put in the guide. Hummm going back to hate mode... no really just seeking some help - I've install and started the new version, however now I have lost contact with my probes. Seems those that had pointed at mission control now show "unknown". Anyway to fix this? You can send a kerbal up to force the target on your antennas and dishes back to mission control. I would like to thank you guys for continuing development and I'd also like to commend you for choosing Github as one of your modes of distribution. Thanks very much for all your work on this, guys! I've been looking forward to this. Woohoo! Thanks to all you awesome folks!